With Pride Month coming up in June, a four-strong panel offered some advice to Advertising Week Europe about how brands should approach events and issues surrounding the event. The panel was chaired by Karmarama planning director Matthew Waksman and included Jan Gooding, chair of LGBT+ equality campaign group Stonewall and former global inclusion director at Aviva; Tag Warner, the new chief executive of Gay Times; and Captain Jamie Carrahar, chair of the British Army’s LGBT+ Forum. Gooding set the tone for the discussion by describing Pride as both "a massive opportunity for brands to show their employees and customers that they are LGBT+ inclusive" and "a political space which can be very toxic and very dangerous if you’re not thoughtful about what you’re doing". Brands are naturally attracted to the exposure provided by the centrepiece Pride London march, which sees an estimated million visitors each year – far and away the biggest of the 37 marches Gooding said take place in the UK. However, she cautioned: "It can just look like a big party, but actually it is still really political. When Prides first happened, they were entirely political – there were more people shouting abuse by the side of the road than cheering people on. "There are [still] over 70 countries in the world where it’s still illegal to be gay and in five countries it’s a capital offence. It is still a protest march." Warner said brands that want to get involved with Gay Times or Pride should be prepared for "uncomfortable lines of questioning" and that "it won’t all be happy-clappy". He said he was realistic that brands primarily approach Pride as a commercial opportunity rather than as a party or political event, but he wanted to challenge them to think about why they are getting involved. Warner explained: "My first question to brands at Pride is: why are you here? Often, the response is: ‘We’ve put a rainbow flag on something and we want to sell it.' The LGBT community, funnily enough, exists beyond Pride; they don’t just appear in the summertime and disappear in winter." Waksman pointed out that the attitudes to brands from gay Londoners can differ from those of attendees of Prides outside the capital. Warner agreed, observing that, while some brands shy away from putting the Pride rainbow flag on their logo, people outside London were more likely to welcome the gesture. "They say that seeing a Pride flag on the logo of my organisation was a huge moment for them," Warner said. "It’s important to understand the different perspectives." Gooding told the audience that, while at Aviva, she let her sponsorship decisions be guided by the company’s LGBT+ employee group, meaning Aviva passed up invitations to sponsor Pride London. This was because the group wanted the brand to be present at Pride events in York and Bristol, where Aviva's biggest offices are. Moving on to discuss brands that got marketing around Pride right or wrong, the panel mentioned Sonos and Holiday Inn. Sonos, the home audio brand, was brought up by Warner because it had asked the Gay Times team to help the business come up with a campaign idea. Warner described how they hit on the idea that music is used by LGBT+ people to overcome the censorship they face in some countries and used Sonos’ backing to tell the story of an "overtly queer" Russian band that faced censorship. The team amplified the story through events away from the main Pride weekends. Holiday Inn was praised by Gooding for the "playful" idea of renaming itself Holiday Out during Pride. "I love things like that, just being an ally, as long as the brand stands up to scrutiny," she said. However, Gooding gave the thumbs down to a "famous brand that just wrapped their burgers in a rainbow for the day" because "everything else about the brand in terms of their attitude to their staff and the supply chain just didn’t stand up to scrutiny". She also highlighted that Stonewall had "got into trouble" last year because it worked with Primark to make a range of Pride-associated clothing than its usual T-shirts. People objected because Primark made the clothes in Turkey, which has a poor record of upholding LGBT+ rights. "We can all get it wrong, but when you do you have to own up to it and then be thoughtful and don’t do it again," Gooding said. Carrahar discussed the Army's decision to put its name to rainbow camouflage cream, which has been taken to Pride events. 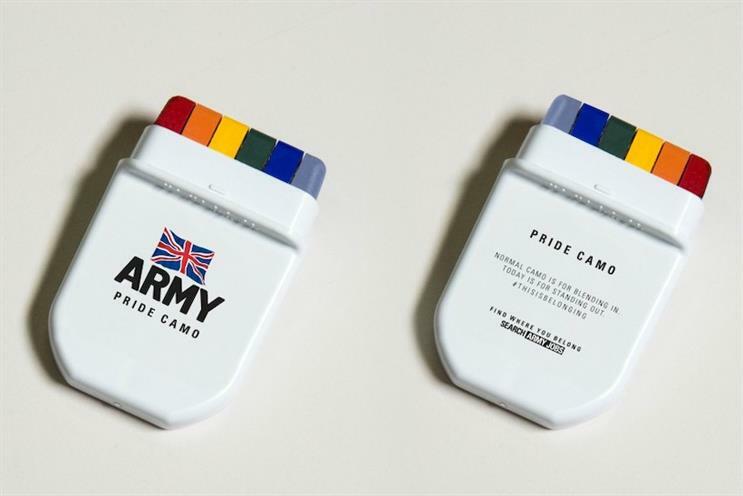 The idea, which came from Karmarama, was to take the camouflage face paint the Army uses and flip it to show its acceptance of LGBT+ people, using the message that "camouflage is normally for blending in, but this is for standing out".